Look and feel the part in training when you rock up in this Puma FtbINXT Pro S/S Football Shirt in a Bleu Azur and Red Blast colourway. This t-shirt has been crafted with dryCELL Technology for moisture management, leaving you feeling dry and comfortable throughout your wear. 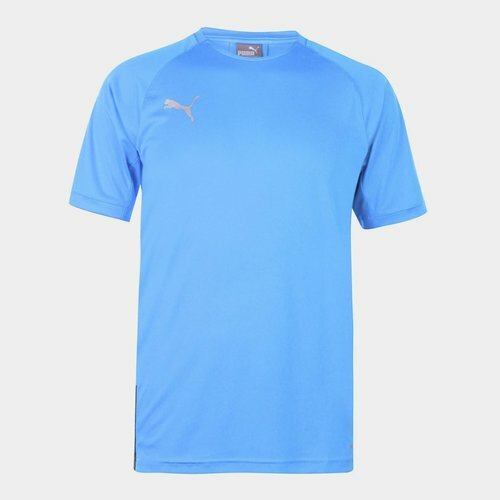 The crew neck, short sleeved tee is crafted from smooth, stretch fabric, complete by the Puma logo. This tee comes as part of the Puma Power Up collection which is inspired by such moments in gaming, when the character, through skill or unlockable item, increases their performance or ability. PUMA want the same mindset to apply when taking your own game to the next level.